The hotel is situated close to Blackpool North rail station, and is just a short walk to the North Pier, shops, Theatres, clubs and the now famous "Funny Girls". 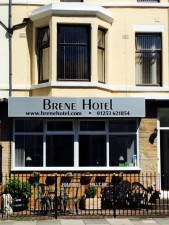 The Brene Hotel boasts a great atmosphere which together with the quality and cleanliness we offer, means our guests return time and time again. Your satisfaction is our main priority, and we endeavour to make your stay a memorable experience.